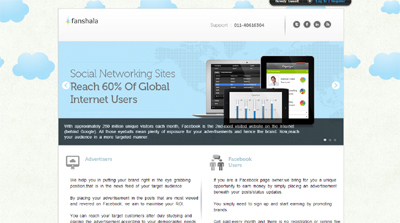 Fanshala is a two sided portal-for advertisers and social media users-specifically Facebook page owners. For advertisers, Fanshala has the biggest advantage in terms of placement,we place the advertisement in the most viewed place on Facebook,the newsfeed of the people. The brand promotion for advertisers is done via posts that are most read and revered on the social networking site. Your brand will have a vantage point and they will tower over other brands because your campaign will not be ephemeral. For social media users,never before have they been given an opportunity on Facebook to earn through their posts and the sign up is completely free. Never before have social media users been able to take a payout via Facebook and the sign up is totally free. For advertisers,the focal point is the vantage point advantage.